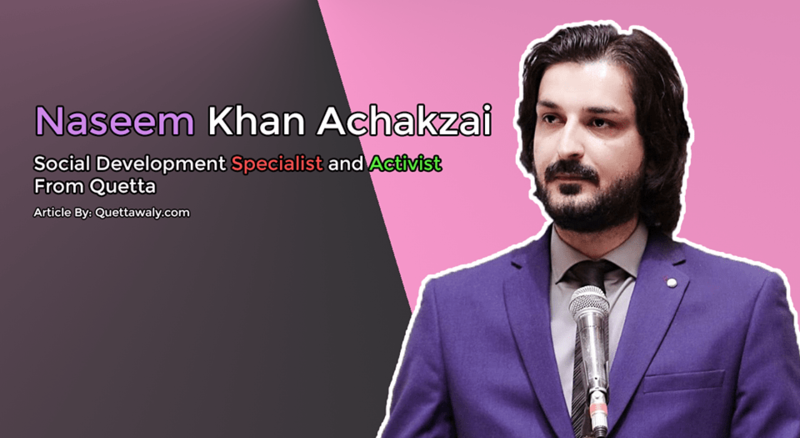 Naseem Khan Achakzai is currently living in Lahore but born and raised in Quetta. He Completed his education in O-levels from Wilderness School Quetta, A-Levels from City School Quetta, Bachelors in Sociology and Economics from the University of Balochistan, Masters in Public Administration from the University of Management and Technology Lahore, MSc in Poverty reduction from School of Oriental and African studies the University of London. He was a Pashtoo Instructor at Kuch Khaas. He was a Director Operations at Comprehensive Disaster Response Services (CDRS). Founder and CEO of Hila a non-profitable, non-political and non-religious organization. Chairman Pakistan Chapter at International Youth Council. He was a consultant at Directorate General Monitoring & Evaluation P&D Department Govt of Punjab. He was a Social Development Specialist at University of Management and Technology. He is a director at the International Youth Summit. He is a Founding Executive Director at CSRP. Naseem Khan Achakzai is a source of Inspiration for all the young blood of Balochistan. He is living a successful life which others aspire. But the fact is that he works very hard and dedicatedly acquire all the hurdles came into his way. He is showing the positive side of Balochistan in the world with his abilities.